This is a story you may use to help explain why a content-focused thought leadership strategy works. Simply put, if you are willing to create content that shares your expertise with your target audience — with no strings attached — that audience is more likely to place your firm at the top of its credibility list, and potentially give you its business. Successful content marketing helps to make the lives of your target audience better in some way. The following story of Ugah, a Neanderthal thought leader, explains how the concept of “Youtility” combined with thought leadership, is a highly effective marketing strategy. This story is meant to be fun (and even a little whimsical) to help gain the attention of your internal audience and spark some discussion around the topic. Let me know how it works out for your tribe. In the days of the original Neanderthal, survival depended on the size of your tribe. The larger your tribe, the more hunters — and the more mammoth meat — you could obtain (our pre-historic “bottom line,” if you will). While the well-fed tribes were stronger and more able to defend themselves, I was running the smallest, scrawniest tribe in the land. As our tribe’s leader, my primary responsibility was to develop a strategy to help us grow. Unfortunately, we weren’t reaching our goal of double-digit increases in mammoth meat; in fact, we were struggling to feed our tribe at all, and were on the verge of, pardon my language, extinction. Determined to survive, we embarked on a marketing campaign to attract more members to help our tribe grow, and we put all of our meager resources behind it. 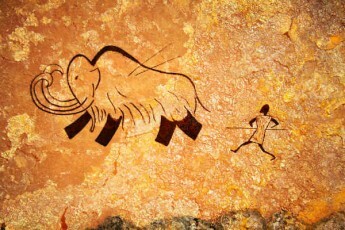 To promote our plan, I painted pictures on the cave walls at all the common Neanderthal meeting places. Our paintings were beautiful and they described the great features of our tribe. I bragged about our capabilities, and about the hunting prowess of our more prominent members. I told what we did, how we did it, and where we lived. It didn’t work. Nobody joined us. Zero “ROCI” (return on caveman investment, of course). The outlook was grim. It seems competing tribes were also creating cave paintings to recruit new members by promoting their attributes. And, guess what? All the tribes’ paintings and all their talking points were exactly like ours. The tribal Elders and I huddled in a large-brainstorming session to find a solution. Our most unique selling point — and the one that had enabled our continuing survival up to this point — was our expertise in hunting mammoth. If we could get to a mammoth herd first, we were quicker and more effective at bringing home the meat than any other tribe, giving us the highest ratio of mammoth meat to members in the entire region. As things were so grim, I decided to give it one last try using a radical, outside-the-cave idea. I proposed that we give away our secret mammoth hunting method, and teach it to anyone who was interested — whether they were a member of our tribe or not. The Elders thought I was crazy. They said, “Ugah, if we tell other Neanderthals in the other tribes about our hunting secret, they’ll just steal it and use it against us. We’ll die out for sure”. I explained to them that by educating other cavemen, our tribe members would become known in all the land as the experts. We would achieve top-of-mind awareness and credibility. We would offer real value, and would ask for nothing in return. Neanderthals from all over would want to be educated in our techniques, and would leave the bigger tribes to join us and learn to become great hunters. The Elders were still highly skeptical, and offered other solutions to draw new tribe members in. The sales Elders suggested putting more Neanderthals on the trails for face-to-face meetings; while the product specialist Elders proposed developing new tools, or creating new ways to keep warm. In the end, as the leader I had final say, and made the decision that we would proceed with my thought leadership strategy. I dispatched our more creative members to draw cave paintings depicting our special hunting technique. We held evening meetings around the cave fires teaching others how to hunt better and more efficiently. We showed them how they could use the time they saved to grow some food and make a more comfortable home. Soon, more and more cavemen were showing up at the hunting seminars, and slowly but surely, our small tribe grew. Within one year, we were the largest, strongest, best-fed, and happiest of all the Neanderthal tribes. It turns out that by teaching cavemen and cavewomen about something they valued and that made their lives easier, the perception of our tribe became one of higher value than any other tribe. One thing the Elders were right about was how other larger tribes would learn from us, then go back and try to duplicate our hunting methods. But our technique took time to perfect, and they could not reproduce it quickly or skillfully enough to achieve our results. They ramped up their cave-painting activities, talking about their global leadership, new tools, great locations, and more, but it ultimately didn’t matter to the target audience. They could improve their hunting techniques, but couldn’t compete with our reputation of value and overall benefit. It turns out that Neanderthals are somewhat self-centered — they cared about what the tools and other attributes could do for them. In comparison, we — the first content marketers — lent them our expertise, and showed them how to use it, with no strings attached, and in return, they gave us their lifelong loyalty. To all you modern marketing Neanderthals living in the 21st century, listen to the wise words of Ugah. If you want to grow your tribe, share your expertise. Educate your target audience members. Give them something they can use to improve their lives. I guarantee your tribe, too, will grow and prosper. For other ideas and insights for advancing your thought leadership strategy (and maybe even your species), read “Epic Content Marketing,” by Joe Pulizzi. Bruce McDuffee helps manufacturing companies significantly increase organic growth by teaching them how to engage with a much larger portion of the target audience through education and sharing their expert knowledge. At his company, Knowledge Marketing for Industry (KMI), he is fond of saying “Knowledge marketing sails where product marketing fails.” Check out his most popular SlideShare presentation, The Manufacturer’s Growth Manifesto and follow him on Twitter @BruceMcDuffee Bruce is happy to entertain more discussion via email or phone conversations (see his LinkedIn profile for contact information).